LANCASTER – Three local couples were honored for their contributions to the community in the seventh annual Family Values Awards Program of the Antelope Valley. Longtime residents Joanne and Clint Nurse, Michael and Kathleen McCullough, and David and Patti Davis were recognized through the program, which is hosted by the Lancaster, Lancaster East and Palmdale stakes of the Church of Jesus Christ of Latter-day Saints. 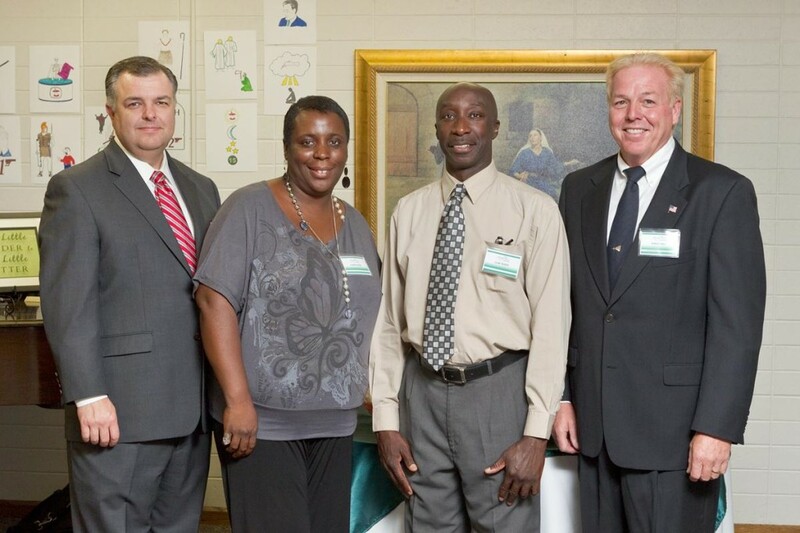 Each stake selected an honoree couple from among a pool of nominees contributed by local members of the Church. 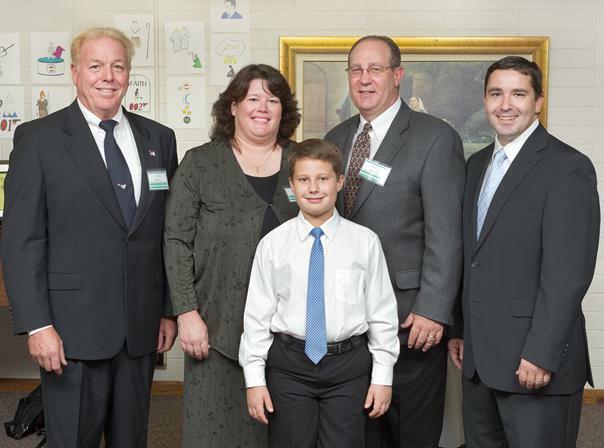 The Palmdale stake recognized David and Patti Davis (with their 10-year-old son, Connor). Photo by John Hill. 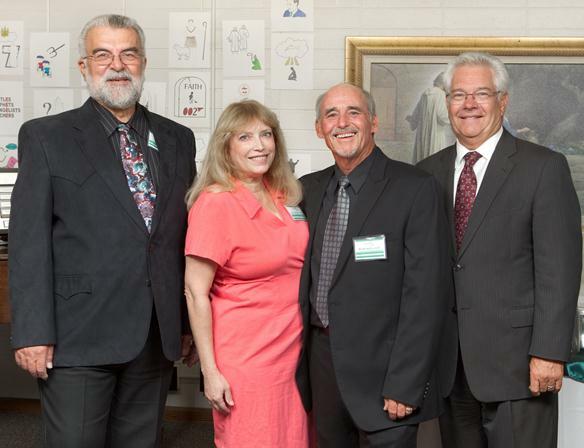 The Palmdale stake recognized David and Patti Davis, who have lived in the Antelope Valley for more than 25 years. Together with their 10-year-old son, Connor, the couple is deeply involved in a number of community service and outreach programs through Central Christian Church. Their service efforts have included involvement in Neighborhood Impact, such as painting homes in underserved neighborhoods; homeless outreach, including preparing and delivering food to the homeless; the Angel Tree program, purchasing and delivering Christmas presents to children with one or more parents in prison; and volunteering for children’s camps. Patti also volunteer teaches a third-grade class at Central Christian Church. David, who works at Northrop Grumman, completed an 8-week course with Connor called “Raising a Modern Day Knight,” which focuses on a father’s responsibility to his son and emphasizes biblically-based lessons related to chivalry, morality and integrity. Joanne and Clint Nurse were recognized by the Lancaster stake. Joanne was born in Trinidad, Tobago and moved around the world with her military family throughout childhood, while Clint grew up in Brooklyn, New York. The pair married in 1993 and have raised seven children together, working to instill the family values with which they were raised. Clint works as a Human Resources Manager in Burbank while Joanne dedicates much of her time to the Palmdale Learning Plaza. The two serve in the Parent Teacher Association (PTA), on various committees, and in the classrooms. When one family’s house burned down, they organized a spaghetti dinner at the school, raised $2,000 for the family, and obtained gift card donations from a number of Antelope Valley businesses. They also regularly contribute food baskets and bags to Southern Antelope Valley Emergency Services (SAVES), as well as to families in their neighborhood that are in need. 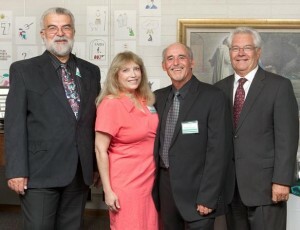 Kathleen and Michael McCullough were honored by the Palmdale stake. Kathleen and Michael McCullough were honored by the Palmdale stake. Michael, who was born in Riverside and raised in the Antelope Valley, is currently in his 16th year as Director of Choral Music at Palmdale High School. His passion for music pervades his resume, as he is currently the Director of the Antelope Valley College Concert Choir, where he has served as an adjunct faculty member for 19 years. Michael is also the Artistic Director of the Sunday Night Singers, a nonprofit organization dedicated to producing quality choral art and new choral literature, as well as mentoring young singers. Michael and Kathleen have been married for 28 years and have two children, Hilary and Timothy. “We are honored to recognize three such deserving couples for the innumerable contributions they have made to our community,” said Crawley. The Family Values Award is designed to honor community leaders who have made outstanding contributions to the family. Honorees are selected from a pool of non-LDS community members who are nominated by local members of the Church of Jesus Christ of Latter-day Saints. The 2012 Family Values Awards Program of the Antelope Valley took place on Sunday, September 16. 4 comments for "Local couples honored for Family Values"
What’s the difference between ‘stakes’ and ‘wards’ pertaining to the LDS? Yes, this outreach to other religions is very nice. Can’t help but recognize a few people in the photos above who are known politically active conservatives. I hope they don’t believe, nor do they advocate the narrow minded theme that only conservatives qualify for the family values awards. Wards are like congregations, the group that meets together every week. Several wards make up a Stake, which serves a larger area. The three stakes, Lancaster, East Lancaster, and Palmdale cover the entire Palmdale / Lancaster area. Anyone in the community who is a great example of family values can be given the award. So what! Conservatives are free to give awards to other conservatives if they want to and they don’t need yours or any other libs permission to do so! It’s nice of the LDS to recognize people outside of their denomination. Most other church groups are too sectarian to do the same, except maybe the United Methodists. It’s usually the rule that churches only value or appreciate their own or those with whom they most closely agree on a theological level.